Please note that our April courses for adult dogs are now all fully booked. 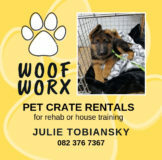 Bookings now open for July.This does not affect pups who can start on any Saturday. 820 Dogs Trained with us in 2018! Our January adult courses are all now in full swing, book now for our April courses.Note that pups under 17 weeks are welcome to join puppy classes at any time – there is no need to wait. We got to say a huge thank you to all our team with a delicious buffet lunch at Moyo in the Kirstenbosch Gardens. Thanks everyone – we couldn’t do it without you! Puppy Classes are not closing! Layla and Cooper showed off their obedience skills at Dancers Love Dogs at the Artscape! Attention 7 to 12 year olds with friendly, manageable adult dogs! Claire is running a 7 week Basic Obedience Course for Kids at Cape Province Dog Club in Pinelands, starting on 13 October at 2.30pm. The course fee is R500. Inbox for more info. Places are limited so booking is essential. Our next batch of adult dog obedience courses start on 13 OctoberOur current adult dog courses are all fully booked. Bookings are now open for our January Courses.Note that puppies can join classes every Saturday and do not need to book in advance. Gillian and Zoe win Gold! Our own Gillian and Zoe won Overall Grade 3 Toy Dog at the SADAA South East Coast Regional Trials. We are so proud of you two! Ann and Michelle took their Roadworx group for a training session on Seapoint Beach Front. It looks like the dogs (and handlers) had a really good time. A brand New Course at CPDC! Introduction to Flyball for Puppies 9-12 monthsCost is R200 (or R250 if you stay on for Beginners Flyball)Try Outs at 2.45pm on 22 October Dogs must be ball crazy, in good health, not overweight and friendly with other dogs. Congratulations to Denise’s group of agility beginners on passing assessment and moving on to Intermediate. Congrats to Chain Reaction (Kylie/Chloe, Roberta/Ben, Lindsay/Moya, Kate/Kujo) on 2nd place at the CHDC show yesterday. All clear runs, and a best time of 23.35s. Well done everyone! Gillian and Zoe do it again! Gillian’s little cross breed Zoe is the Top Grade 3 Toy Dog and Games Dog at the Free State Agility Regional Trials. The kids are having a fabulous time and learning as they go along. Hopefully we will have many more Day Camps in the future. 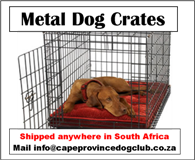 Thanks wonderful Cape Province Dog Club doggy people. We managed to donate 75 blankets to Animal Anti Cruelty League to keep shelter dogs cozy this winter. Special thanks to Alison, who did the delivery and Elisabeth who arranged us a staff discount. Carling – taken too early at 5 years old. Passed away quietly in his sleep from a heart attack. Our deepest sympathy to Ann and Jonathan who have been part of our club family from the very beginning. Our current Behaviour Course handlers are already seeing improvements in their dog’s behaviour after only two lessons. Aggression with other dogs CAN be managed with the correct techniques. We wish we could cure it but unfortunately, we can’t. .
Good News! To alleviate the parking problem, we have cleared the lane next to the agility garage which will allow parking in Uitvlugt. You can turn into Uitvlugt from Forest Drive, continue round the circle and straight on – until you see a small grey electricity box which is at the entrance to the lane. On Sunday we enjoyed a lunch at Suikerbossie to thank all our volunteers for another year of hard work. I can’t quite believe we have been at Pinelands Primary for 20 years!! Could your Dog Become a Therapy Dog? Mom, Please Can We Get a Puppy?